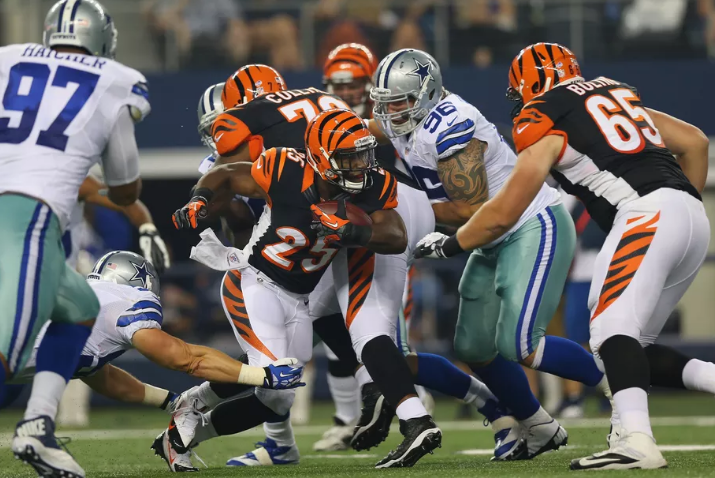 The Cincinnati Bengals and Dallas Cowboys have a hot match up on Sunday evening in a important Week 5 game at AT&T Stadium. For many NFL fans, the Cowboys have been a really big and interesting surprise of the 2016, they’ve gone 3-1 to start the year which has them beaming. They were able to survive the loss of starting quarterback Tony Romo, so now the team will have a chance to prove to everyone how good they really are in this tough head to head. They’ll play host to one of their toughest opponents to date when they host the Bengals. The Cowboys so far have only gathered wins against weaker teams like the Washington Redskins, Chicago Bears and the San Francisco 49ers. All these teams that the Cowboys beat have a combined 4-8 record. Against a more formidable team, Dallas lost, more specifically to the New York Giants in the season opener, who are also surprisingly only 2-2. 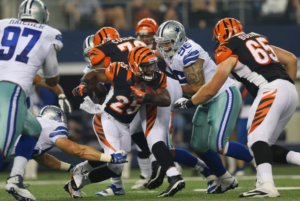 For Cincy, if there is any team that has had the opposite of what Dallas faced, its them. They got stuck with the toughest schedule to start the NFL season. It would be hard to find a team who faced a more exhausting test than the Cincinnati Bengals face in the first six weeks of the year. They’ve had back-to-back road games to open the season at the Jets and Steelers, and then had to go up against the defending Super Bowl champion Broncos, to then go up against the pesky Dolphins on a shortened week. So Week 5 marks the start of a two-game stretch that could end up being the difference in whether they make or miss the playoffs this year, in a power packed and super-competitive AFC division. But before they head off to the intimidating Foxborough, Mass. field next week, and face off against a rejuvenated Tom Brady and the Patriots, Cincinnati will have to go deep south, into the heart of Texas and have an answer for the up-and-coming Dallas Cowboys. This is a team that is making strides and keeping pace in the NFC East. Both teams had many experts speculating in the off-season about whether they could make deep run in the playoffs. So Sunday’s game will certainly give one of these two teams some much-needed momentum after a not-so-hot first quarter of the season. The Bengals will be looking and working hard to put together back-to-back wins for the first time this season, They need to win a game to get above a .500 record. QB Andy Dalton is completing 66.4 percent of his passes for 1,234 yards, he has three touchdowns and two interceptions. Dalton has only had one or less touchdown passes in his last five games and that number has to go up because their rush game is not that well backed up. A.J. Green and Brandon LaFell have combined for 676 receiving yards and two touchdowns while Giovani Bernard has 19 receptions. Cincinnati’s ground game is only averaging 80.8 yards per contest. Jeremy Hill leads the way with 221 yards and three touchdowns. Defensively, the Bengals are allowing 20.5 points and 322.8 yards per game. Karlos Dansby leads the Cincinnati Bengals with 26 tackles and they will need him today to perform. Carlos Dunlap has three sacks and Adam Jones has one interception so they will have to be on point. The Cowboys will be greedily looking to win a fourth straight game, and they will need a win if they want to stay in the race for the NFC East division. QB Dak Prescott is completing 67.9 percent of his passes for 1,012 yards, and he has three touchdowns and a strong zero interceptions. Prescott has not turned the ball over despite making 131 pass attempts. Cole Beasley and Jason Witten have combined for 468 receiving yards on 44 receptions. Terrance Williams has 11 receptions. The Dallas Cowboys ground game is averaging a decent 149 yards per contest. Ezekiel Elliott is leading the pack with 412 yards and three touchdowns. On the defensive, Dallas is allowing 19.3 points but 358.3 yards per game. Sean Lee leads the Dallas Cowboys with 35 tackles, Tyrone Crawford has two sacks and Barry Church has one interception, so these guys they will have to up their game to beat Cincy. The Bengals have had a little extra time to prepare for this game since they last played last Thursday. They have a defense that’s produced nine sacks and four interceptions so they are tough to play against. This game is going to test the rookie Dak Prescott thoroughly so if he can win it for the team, he will solidify his role and not just as back-up QB. It’ pretty likely he will be able to pull it off since as an observer one has to be impressed with the way Prescott and Ezekiel Elliott have handled things in the wake of Romo’s loss. And they’re only getting better every week after knowing where to find each other on the field. Statistically, the Cowboys are a much better team at home than they are on the road. And it’s probably why they are a popular pick to beat the Bengals this week after beating the San Francisco 49ers last week. They passed that test, but tonight might be a lot more complicated than they expect and the Bengals are hungry. We’ll take the Bengals to beat the Cowboys at home on Sunday.